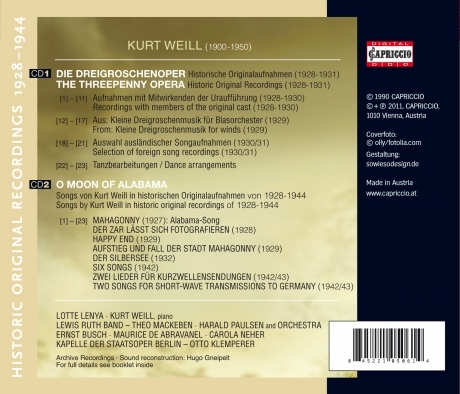 LOTTE LENYA & KURT WEILL · KAPELLE DER STAATSOPER BERLIN · OTTO KLEMPERER · LEWIS RUTH BAND & THEO MACKEBEN …. Something valuable is presented here. 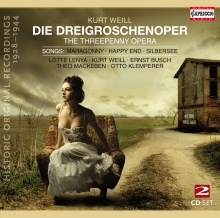 Between 1928 and 1932 there appeared, on 20 different labels, altogether more than 40 black discs with Dreigroschenoper songs, vocal recordings as well as instrumental versions and dance arrangements. The present CD offers a representative selection from these. Recordings that appeared between December 1928 and December 1930, with various members of the original cast at the Schiffbauerdamm. Most of them are here reissued complete for the first time.The 2nd CD now gathers together shellac recordings from other Weill works of the years 1927-33. They are joined, as further rarities, by two American record productions by the Weill-Lenya pair of artists from the years 1943/44.